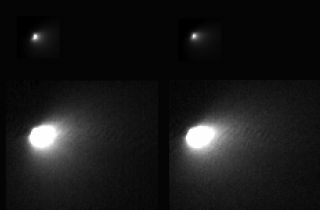 These four images taken by NASA's Mars Reconnaissance Orbiter show Comet Siding Spring as it made its closest approach with Mars on Oct. 19, 2014. A NASA probe orbiting Mars and a rover on the planet's surface have beamed back some amazing views of a comet that made an extremely close pass by the Red Planet on Sunday (Oct. 19). The space agency's Mars Reconnaissance Orbiter (MRO) and Opportunity rover took some incredible images of Comet Siding Spring (also called C/2013 A1) as the icy object zoomed past the Red Planet over the weekend. "This composite image shows two versions of each of two of the best HiRISE [MRO's High Resolution Imaging Science Experiment camera] images of the comet," NASA officials wrote in an image description today (Oct. 21). "Shown at top are images with the full dynamic range, showing the nucleus and bright coma near the nucleus. Shown at bottom are versions where the fainter outer coma is brightened, saturating the inner region. The images at left and right were taken about nine minutes apart." NASA's Mars Exploration Rover Opportunity obtained this view of comet C/2013 A1 Siding Spring as it hurtled past Mars on Oct. 19, 2014. With these photos, MRO also revealed some important science. Scientists now know that the comet's nucleus is not 0.6 miles (1 km) across, as previously predicted. In fact, the probe's pictures show that Siding Spring's nucleus is actually less than half that size, according to NASA officials. NASA's Mars Exploration Rover Opportunity made this 10-second-exposure view of comet C/2013 A1 Siding Spring, as it flew past Mars on Oct. 19, 2014. Opportunity's photos, released Monday (Oct. 20), show the comet just before it made its closest approach to Mars. The rover was bathed in sunlight during the closest point in the flyby, so ground controllers decided to take the images before dawn. The images taken by Opportunity show the streaking comet in a sky dotted with a few stars and the affects of cosmic rays hitting the camera's light detector and distorting the photo. "It's excitingly fortunate that this comet came so close to Mars to give us a chance to study it with the instruments we're using to study Mars," Opportunity science team member Mark Lemmon of Texas A&M University, who coordinated the camera pointing, said in a statement. "The views from Mars rovers, in particular, give us a human perspective, because they are about as sensitive to light as our eyes would be." NASA's Mars Exploration Rover Opportunity made this 10-second exposure of comet C/2013 A1 Siding Spring as it zipped past Mars on Oct. 19, 2014. Image taken from a two-image blink GIF. MRO and Opportunity weren't the only NASA spacecraft charged with gathering data about the comet as it flew by Mars. NASA's Mars Atmosphere and Volatile Evolution (MAVEN) probe and Odyssey also survived the close encounter with the comet from orbit around the Red Planet. All of the orbiting spacecraft hid behind Mars as the comet passed, in order to be shielded from speeding pieces of Siding Spring's debris. NASA's Curiosity rover was also in a position to see the comet's flyby from the planet's surface. Other space agencies around the world also planned to use their Mars spacecraft to observe the comet's flyby. India's Mars orbiter (called Mangalyaan) and Europe's Mars Express probe were expected to gather data about Siding Spring.